The California State Athletic Commission has released the official salaries for all of the contestants who competed in Saturday’s “UFC on FOX: Shogun vs. Vera” extravaganza. 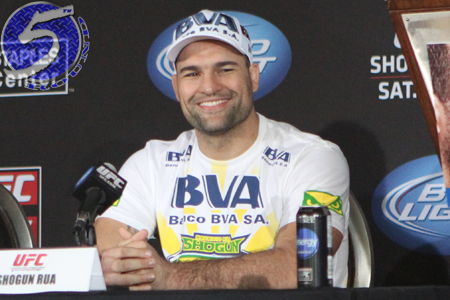 Although his 4thRound TKO victory over Brandon Vera in the show’s featured attraction wasn’t good enough to earn top contender status, light heavyweight Mauricio “Shogun” Rua (Pictured) still left Los Angeles as the night’s highest earner. The Brazilian pocketed $240,000 for his performance, with $70k coming via win bonus. Lyoto Machida was the second-highest paid athlete. He took home a flat $200,000 paycheck and next crack at the 205-pound crown for putting Ryan Bader to sleep in the co-main event. Staples Center in Los Angeles hosted Saturday’s event.